The seventh album from Swedish metalmongers Grand Magus comes after something of a letdown in 2012's The Hunt. The band have arguably been on a downward trajectory since their doomy beginnings, getting very close indeed to playing some sort of hard rock in The Hunt, although I didn't find it as much a disappointment as some. Grand Magus have a vein of steel set deep in their hearts that makes even their rock-ier moments worthwhile, and although Triumph and Power isn't a full return to epic doomy glory, it is a step back towards their heavy metal stylings, and is more than epic enough for most tastes as opening anthem On Hooves of Gold We Ride proves. Slow, stirring riffs driven by JB Christoffersson's undeniably well-suited-to-epic-metal voice; it's a simple but effective formula, and Grand Magus prove they have the songwriting ability to get the best from it. It's a solid album, put together with skill; songs flow into each other, riffs work their way into your head and the vocal hooks are frequent and fist-pump-worthy. Controversy will arise, of course, and Steel Versus Steel sounds closer to 80s Judas Priest at first than what you'd normally expect from Grand Magus. Is it bad? No, far from it; this sort of catchy foot-tapper is excellent when done well, and JB and co pull it off well (although the song doesn't need to be over five minutes long). As if knowingly, the following Fight opens with the sort of lovely metallic chug that we're used to from previous albums, and it's a return to anthem territory. The title track opens with the heaviest chug yet, but the guitar soon vanishes as the song slips into a sort of ballad, driven by bass and vocals before JB brings the riffs back in. And from then on, the band hardly put a foot wrong – Dominator is a classic-sounding metal tune with everything from infectious verse riffing to a chorus with backing vocals, Holmgång adds some folky flavour to the formula, and closing tune The Hammer Will Bite slows things down and adds that touch of bloodthirsty vigour that we've missed from them. 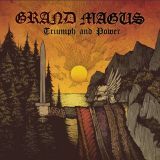 As long as that fist-pumping viking element remains in their music, Grand Magus will be worth listening to; I can see them even becoming a sort of heavy metal Amon Amarth, pumping out the crowdpleasers and making their sound more formulaic with time. I'd rather that didn't happen, though, and I doubt it will - moments here like folky interludes Arv and Ymer show that the band are very much in touch with their roots, and as much influence as they've taken from classic heavy metal, it's a compliment to Grand Magus that they've absorbed them into their sound rather than becoming a clone. Going back and giving the wonderful Wolf's Return (my favourite from them to date) it's interesting to note that their sound hasn't actually changed so much, beyond a cleaner sound and an increase in catchiness, only the loss of the doom elements is there to mourn. And mourn it I do, although Grand Magus are a solid band, when all is said and done, and this is a fine collection of songs. Those turned off by The Hunt should definitely give Triumph and Power a listen – fans will love this.